Joe Clark, Sports Editor of Pantherbook writes about the Franklin DECA program taking awards at the State level. 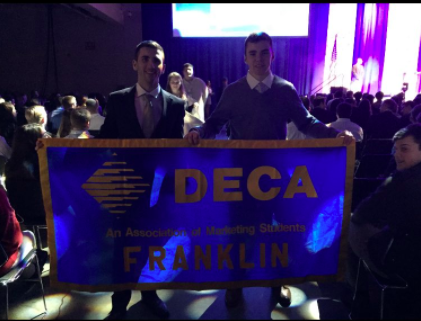 "On the weekend of March 8th-March 10th, 26 members of the Franklin High School DECA club headed to the Marriott Copley Place in downtown Boston for the 2018 Massachusetts DECA State Career Conference. At the event, students attended leadership and networking conferences, heard from guest speakers, and most importantly, presented their projects. Projects ranged from developing marketing plans for local businesses, promoting entrepreneurship, and creating their own ideas for an independent business. Students also had free time during the day, where they could attend seminars hosted by industry professionals. The club also took home some awards, none more notable than Arun Kavishwar and Saketh Saripalli taking home third place in the Individual Business Plan Competition, which clinched them a spot in the International Competition in Atlanta from April 21-25."